Greek Yogurt Recipes, Why All the Hype ? Nutritionists have championed eating yogurt for years. 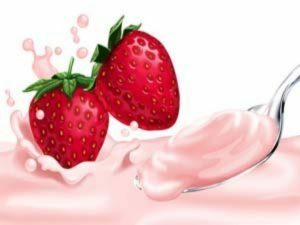 Now, the introduction of Greek yogurt has brought with it even more benefits and health advantages. This yogurt has essentially the same nutritional value of traditional yogurt, with the main difference being that it is packed with almost twice the protein of traditional yogurt and tastes better than sugar free yoghurt. Additionally, it has less sodium and carbohydrates and helps the eater feel fuller sooner and lose weight on a yogurt diet. One of the many complaints of this food item is the fact that consumers do not know how to incorporate it into their dishes. Use the following guide for some yummy, and healthy, Greek yogurt recipes you should try. Simply skin and dice six to eight red potatoes, boil until tender and then mash with eight ounces of Greek yogurt. You can add chives for additional flavor. This is a great dish for lunch or a light snack. In order to make this dish simply combine raisins, carrots, and pecans and then mix with eight ounces of Greek yogurt until smooth. Make sure there are no lumps in the mixture and enjoy. However, dips are not the only recipes you can create with this yummy treat. Mix the Greek yogurt in with your ground beef, turkey or chicken when making burgers. This will add a zest to the taste that is unique and family pleasing. Substituting any mayonnaise in a recipe with the Greek yogurt. This ingredient can be used to make salads, a dressing for sandwiches and anywhere else you need flavor. This ingredient can be combined with others for any time of day dish. Breakfast, lunch, snacks, dinner and desserts can all gain a healthy spin with this ingredient. 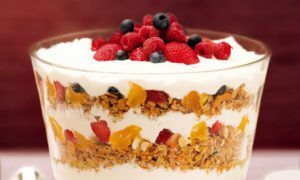 Make a yogurt parfait with fresh fruit of your choosing, granola and Greek yogurt. This makes a great summertime treat. If you are making a sour cream pound cake you can actually substitute the sour cream for Greek yogurt. This will give your cake the same consistency and lose some of the fatty content the cake usually contains. Ice cream can also be made with Greek yogurt. Simply substitute the cream you would typically use in order to make a healthier treat. As you begin substituting fattier foods with Greek yogurt you will notice some immediate benefits. For example, Greek yogurt contains less lactose, which means that it is much easier to digest than traditional yogurt. Also, due to the creamy texture of the yogurt you will be able to incorporate it into many different dishes for a healthy spin that your whole family will benefit from. The only downside to Greek yogurt is that it contains less calcium than traditional versions. This is due to the process it undergoes when being created. However, if you supplement with other sources of calcium you will not have any negative effects from this fact. The fact is that there is no superior yogurt. Both have health benefits that can make you feel better, help you lose weight and be added to recipes for healthy versions of family favorites. Greek yogurt recipes help you learn to implement this ingredient into your diet. Pretty soon you will crave the taste in foods that you would traditionally use a fattier product for. This healthy yogurt makes a great salad dressing and able to be substituted in almost any dish you cook. Blend the blueberries, honey and lemon juice in your blender till smooth. Add yogurt and milk and blend some more. chill the mixture in the freezer. Stir well every 2-3 hours to break up the ice crystals and give it ice cream texture. You and your whole family can enjoy frozen yogurt recipes any time of the year.